Join the discussion on our forums! 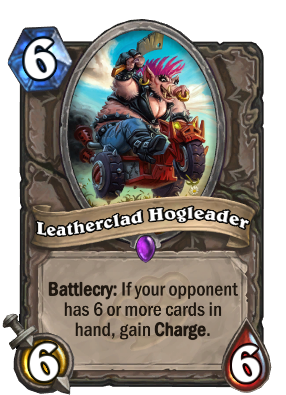 Come discuss Leatherclad Hogleader over in our dedicated Leatherclad Hogleader discussion topic. I prefer taking this over Boulderfist Ogre. Niche situations to hit face for 6 damage is more powerful than 1 health in many situations. Leatherclad? So she's a pig wearing a cow? "Yes, this literal pig-woman has appropriately sized breasts." this card is insane in arena if your opponent has a slow hand. Will we start seeing more of this now that handlock and other reno control decks are popping up? especially with hand pumping mechanics. When the effect triggers, the card actually shakes and releases some smoke like an engine turning on. I really like the detail. Battlecry: If your opponent has 6 or more cards in hand, get Triggered. Seems very Strong and Independent. 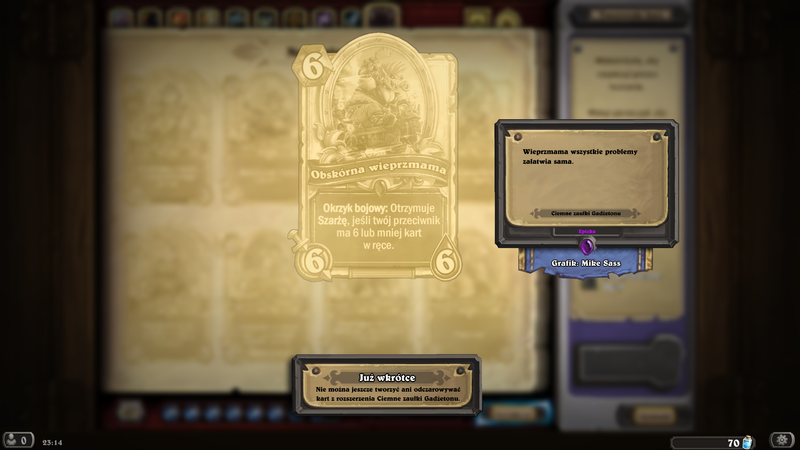 But really change that error Blizzard PL. Any control deck is going to have 6 cards in hand (Priest, Warrior, Rogue, Druid), mages also have plenty of cards. Any Pro game I've watched they always have more than 6 cards for most of the game. If the meta shifts from Aggro to Control, this card will be in a lot of decks. If it buffs from Don Han'Cho, you have an OTK minion. Windfury. People compare this to Goblin Sapper, but I think this might be a tad better. One of the problems of the old crazy Goblin was that once he was played, the opponent would start playing cards to be under the hand-size threshold. However, this lady has her effect as battlecry, meaning if she is played meeting the condition, you're enemy instantly suffers the weight of her bike and her bacon in the form of 6 damage. Still, she won't see play outside gimmicky mill decks. Has no one thought about the possibilities with Mill Decks?